As you can see, it lists the RAM as DDR4 in Max Bandwidth whilst looking at the specific slots; but the ''Type'' is still shown as ''Unknown''. (Black slot) Slot 1 - 8GB G.Skill DDR4 @2133MHz. (White slot) Slot 2 - 4GB Micron Technology DDR4 @2133MHz. (Black slot) Slot 3 - 8GB G.Skill DDR4 @2133MHz. (White slot) Slot 4 - 4GB Micron Technology DDR4 @2133MHz. The PC originally came with 8GB of DDR4; the above listed Micron Tech RAM. It's a prebuilt Dell XPS 8900, ordered off the Dell website. The day it arrived, speccy still claimed it was ''8.0GB Dual-Channel Unknown @1063MHz''. 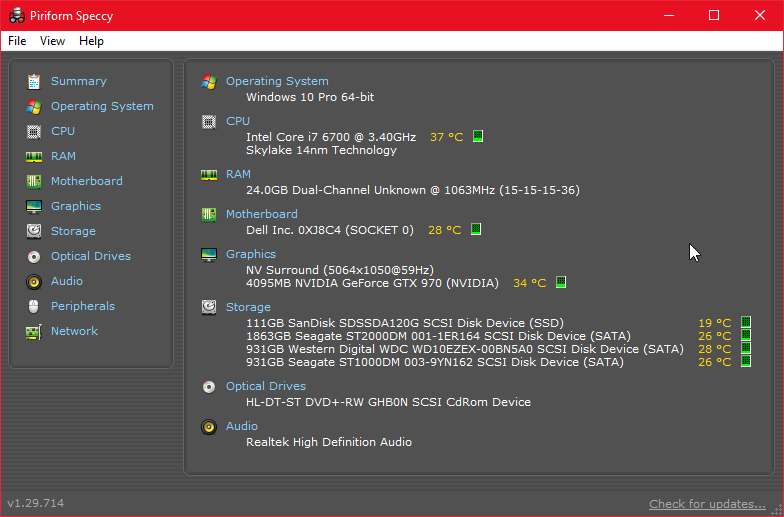 So, it wasn't an issue from adding the extra RAM, as it still choked up from the professionally installed ''stock'' RAM. With DDR2 and DDR3 RAM, speccy identifies it just fine. The only time it decides to complain, is when I use DDR4. - How new/old are these "DDR4" memory chips ? How old is your system ? I wouldn't be surprised to see that SPECCY's program code needs to be improved to be able to detect these kind of memory chips. - Do you have documentation for your motherboard ? Perhaps that will tell you in what slot what kind of memory needs to be inserted. - How new/old are these "DDR4" memory chips ? - How old is your system ? I wouldn't be surprised to see that SPECCY's program code needs to be improved to be able to detect these kind of memory chips. - Do you have documentation for your motheerboard ? Perhaps that will tell you in what slot what kind of memory needs to be inserted. As can be seen in the screenshots I provided, the RAM sticks are from 2015. I purchased my Dell XPS 8900, in April of this year; 2016. I'm fairly certain that Dell has a digital documentation somewhere, but no. It didn't come with a manual. And no, lol. I think you've misunderstood/skimmed what I typed out. My motherboard supports DDR4 RAM. I explained that I wasn't sure what the proper ''order'' the sticks needed to be in. Quad Channel and Dual Channel performance entirely depends on the orientation of the sticks. With that said, there's most likely documentation of sorts online somewhere, detailing this. Regardless, my RAM installation isn't the issue here. It's been about a month since I installed the new RAM. Everything runs and functions perfectly. I just recently (today) became extra curious about this, so I decided to create this forum account and post about Speccy's behaviour. But yeah. I was thinking along the same lines -- Speccy may not be coded to recognise DDR4 yet. - Yes, I know your motherboard would supports DDR4. Otherwise your system wouldn't have functioned (that) well. 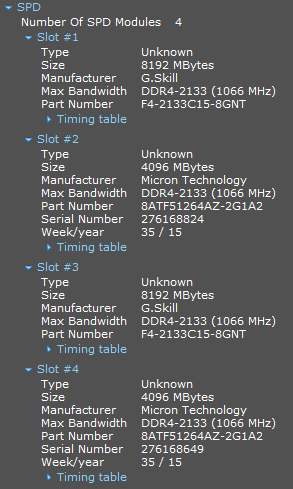 - If you open "Timing Table" (under each slot in that SPECCY snapshot) what kind of info shows up ? Would provide that extra/usefull info ? I think you're misunderstanding the point of this post, lol. I'm not asking for help. I'm not trying to troubleshoot an issue. I simply wished to report a bug, for the Piriform developers to see.. This simply displays the speed (in milliseconds) and the voltage of each chip on the RAM stick. Couple of PDF's here Lue for your machine. - @LUE: I do understand that're only wanted to report a bug. - The last screenshot suggests that that part of the SPECCY programcode does recognize of "what's going on". Sadly, it doesn't say anything about the specific RAM stick orientation. I'll need to look up a guide for that; I'm sure a quick google search will be fine. Well, yes. It does seem to recognise every aspect of the Chips, other than being able to label it as DDR4. So no, it's not a big issue. I just felt that any bug; small or not, was worth reporting.